Thinking you can afford certain things and actually being able to afford them are two different things. Be it a car, a house, latest smartphone or even those clothes you bought off sale; can you really afford it? Things are getting easier if you are planning to make a purchase these days isn’t? You don’t have cash – use cards; still if you feel you won’t have enough – go for EMI on your credit cards. If you don’t find the time to go and buy stuff, get online – check out some great discounts and buy. You can pay at the time of placing your order or can opt for cash-on-delivery. It is all so easy and convenient isn’t it? And to add to it, it is all so ‘affordable‘. I mean come on, I don’t have to pay in full, I just need to swipe my card and pay in EMI. I can afford that. Also those sites offer so many discounts – all of them have 10%, 25%, or even 50% off. Discounts are great to make stuff affordable. And those tele-shopping ads, they sell so many ‘cool’ things at so much discount; wow. Life can’t be better for a shopper. Even in real estate – builders are offering so many schemes 25% now and then 75% at the time of possession, no EMI till then so you can book a home today and not worry about anything for the next 1 or 2 years. Same goes for cars. Almost every company is offering great discounts on new models, buy-backs, and easy finance to own a car; you can ‘afford’ a car too. Even smartphones are available on EMI. Just go and shop. Things are SO AFFORDABLE. Or really, are they? Actually, you cannot afford most of these on a normal budget. 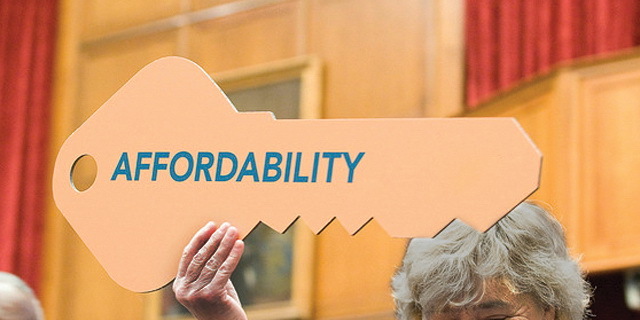 It is a myth about affordability. What you can afford is the EMI and swiping of cards and the temporary down-payments. Whether you can really afford something or not depends on how well you manage your money post your EMI and credit card payments. If you are left with some decent amount of savings after you have paid your bills, EMI, credit card dues, invested well and have a contingency fund in place, then yes you can afford stuff from the left over money at the end of the month; or else not. Affordability myth is the factor that most sellers target and make you feel you can afford stuff and it in a way boosts your ego about your own self that you can AFFORD things. I mean we all work hard for money and achieving our goals and if someone tells us that the goal we are working towards is so easy to own since it is affordable, we love it. If you want to buy a home but are not able to go for a home loan right now, you pay 20-25% and book a home and worry about the EMI 2-3 years later. Great! But you can only truly afford the house if after 2-3 years all your other liabilities are paid off or your income has increased substantially. Current job market is not that great and the payment appraisals are lower as compared to before. Maybe yes, 2-3 years down the line you could have a better income, but you will not know your true affordability of the house till then. Also Read: 8 Reasons Why starting a Business may not suit you? Same goes for cars and smartphones and other things. Swiping cards or stretching some expenses in a month to be able to ‘afford’ certain stuff is not a measure of affordability per se. It is the perception of it. True affordability is only when you are not stretching or eating up much from your savings, unless you have saved specifically for that. Or else as time goes by, this perception of affordability will eat away your savings and finances to a point where you won’t be able to afford things you did so easily now, even the basic essentials. I personally know someone who has a pretty great income and can easily afford most of the things if he saves well. But his perception of affordability is clouded by discounts, sales and EMI, and so instead of postponing some purchases for a month or more he opts to buy them when such sales are on or EMI is available. What this resulted in is an EMI for home loan which is essential since having a house is of paramount importance. So it is an expense that is needed and unavoidable. Then came the EMI for the car loan. Again it didn’t pinch that much, since his income was great. But this convenience of buying things on EMI was inculcated in his psyche and then came the credit card EMI and so on. Ultimately that great income felt meagre and the idea of Affordability finally had to change. His affordability was for the EMI and not the product itself. He finally realized he has all the stuff he wanted, but not the SAVINGS he would like for a secure future of his family. Ultimately he cancelled his credit card and cut down of expenses and started to save. He only has the Home loan EMI and has pre-paid the car loan from his savings. His Affordability Myth is finally shattered. For all us, what we can afford is relative, but as long as it is not burdensome on our finances and leaves us with decent savings and investments for a secure financial future; it is true affordability, if it drains us for cash every couple of months, then it is not. It is very important to understand our perceptions about affordability and get our acts together.